The release of two nuns and three orphans who were kidnapped and held without explanation by ISIS/IS for 17 days in Mosul has been briefly mentioned in a few news outlets. However, I thought it might prove useful to provide here the full account given to me by the nuns, with whom I met last Monday (Jul. 28, 2014), along with two of the three children that had been kidnapped with them. This account doesn’t contain any ground-shaking revelations, but the details will be interesting for those interested in what happened. 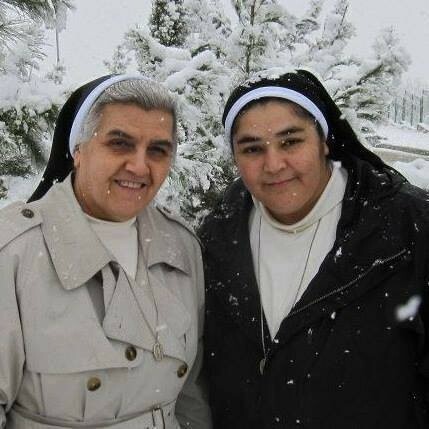 The two nuns were well-known for their many years of work among Mosul’s needy. Though they were not harmed while being held, their unexplained disappearance was unnerving for the Christian population, and added to the number of factors that terrorized Christians before their final mass departure on Jul. 17. Sister Miskinta al-Dosaky Myko and her superior, Sister Atur Joseph had initially fled to Kurdistan province when ISIS took over Mosul, as had many other Christians. And as many others had also done, they ventured back into Mosul after ISIS offered pledges of safety to minorities. On June 27, the two nuns, along with three orphans in their care, drove from Kurdistan Province to Mosul, to check on the orphanage that they were in charge of, and to check on a number of poor families to whom they frequently gave assistance. In their car they carried food and money that they planned to deliver to needy families. The children were brought along to gather their things from the orphanage, as they were going to relocate to Kurdistan. They were apprehended by ISIS fighters while in one of the neighborhoods where they often distributed food. Two jihadists spoke to them, a Syrian and an Iraqi. The nuns had the impression that the Iraqi was reluctant to give the nuns a hard time, but the Syrian pulled rank somehow and said that they had to come with them, “to answer questions.” He demanded their keys, saying he would drive their car, but the nuns refused, whereupon the jihadists allowed them to drive, and escorted their vehicle with their own vehicles. They were taken to a house in the Danadan neighborhood. The house had apparently belonged to an official. The nuns and children (two girls, one boy) were held in a library inside the home. They were kept in this room for 5 days. The nuns already wore habits, but the girls—though merely adolescents—were made to wear hijabs by the fighters, who didn’t want to see them uncovered during the moments when they were escorted out of the library to make visits to the bathroom. The Tunisian seemed to have had no experience with or understanding of Christians; the Iraqi, on the other hand, understood what nuns were and wasn’t so bewildered by this “perplexing other.” The Tunisian just wasn’t able to come to terms with an actual encounter with someone who would believe that Jesus was the son of God and regularly hassled them about it. After 5 days like this, they were moved to another location where they were held for 12 more days. A fighter further up the chain of command visited them and assured them that they wouldn’t be harmed, saying “Didn’t you see what happened with the nuns in Ma’loula? We’ll let you go just like them.” The ranking nun protested, telling him it was already an act of harm to be held without cause in this way. The fighters themselves seemed confused as to why they were keeping the nuns, and why they had taken them in the first place. Initially, the nuns’ habits seemed to scream “foreign agent” in the minds of the abductors, yet the nuns had no authority, political activity, or even dealings with leading bishops. That merely wearing garb that was unusual to the jihadists would make them appear as some kind of external political agents highlighted the complete ignorance of the fighters. At one point, they pressured the nuns about the War in Iraq. They said, “We’re the Dawla Islamiyyah and we’re against the U.S., Israel, China, Korea, [etc.] What about Bush’s crusader war that he conducted in Iraq! Why don’t you tell them not to do these things! ?” It was as though the fighters believed that being Christian meant that the nuns were “agents of America” who had the president’s ear. The abductors were not rogue opportunists acting alone (the nuns’ eventual release occurred without ransom); they were regularly in contact with ISIS leadership and would tell the nuns things like “You have to stay here until we hear from the emir.” The declaration of caliphate (and corresponding shift from ISIS to IS) occurred while the nuns were in captivity. The children regularly cried throughout the ordeal. The head nun told me that despite the injustice of their arbitrary captivity, and the fear that they all felt, she reminded herself that “I must not hate them, but rather I should love them; they are the ones who are sick and need healing.” She said that she spent a lot of their empty time praying for her captors. They were always provided with food and water, though the nuns claimed they were very selective about what food they accepted, not impressed with the cleanliness of the environment. (“We didn’t trust the dolma…”) They described the conditions of the houses as very dirty; the fighters supposedly never cleaned it and would leave food and trash on the floors. Two days before their release, a man “in Saudi clothing” came and tried to convert them to Islam, which they declined to do. Finally, they were told that they would be released. The fighters seemed unable to decide what to do with them, again confused about why they had nabbed them in the first place. At some point they came to see the nuns as a means of communication with the wider Christian community through which they could make an announcement—another absurdity—and decided to use them in this way before letting them go. The night before their release, their phones were brought to them and they were told “Call somebody we can talk to.” (This is all demonstrative of ISIS’ very poor performance in engaging with the Christian community.) The nuns called a priest who was in charge of overseeing orphanage work. The jihadists then spoke to the priest and gave him options for Christians that he was to convey to the Christian community. This was the evening of July 13, four days before the IS ultimatum issued to Christians on Thursday the 17th, and the options given over the phone differed from those issued later. The instructions given to the priest were that Christians must become Muslim or pay jizya and accept the “Shurut al-‘Umariyyah,” a set of strictures for Christian behavior, attributed to an early agreement between conquered Christians and the Caliph Omar, that involve markers of subservience to Muslims and the abstention of any public display of Christian religious practice. In trying to have the nuns convey this message to the larger Christian community by simply having them call a random priest who wasn’t even a leading figure of the local Christian community (which is made up of multiple denominations), the jihadists gave the impression that they didn’t know who to deal with in the Christian community. This is one piece of a larger picture in which IS entirely reneged on their self-declared responsibilities as the “new, approachable law and government,” and failed to engage the Christian community. The nuns were released on July 14th. Their car, and the money that was in it, were never given back to them. Upon release, they were told they had to be accompanied by fighters “to protect you from terrorists who might kidnap you for ransom.” The nuns rejected this, but the fighters wouldn’t budge, nor would they give them back the keys to their orphanage, which the nuns said they wanted to return to. That was the last time they saw Mosul. A few ISIS members kidnapped 2 nuns and few kids for a car and whatever loose cash they had on them. Could the 17 day detention and the calling of the priest be an attempt to make the whole thing not look like a common hold up? What if suicide bombing is a way of internally culling the more extreme or unstable members of a group? Interesting to note the role of the Tunisian in this narrative. Fighters from Tunisia has gained attention in several media aticles involved in acts of execution. Thank you for an exellent and insightful article. Seems like Iraq needs a Bashir Gemayel. I wonder how much more Iraqi Christians can handle. Mary is mentioned in the Koran 34 times and Muslims have a great reverence for her. Many thousands make pilgrimages to a shrine which the isis destroyed. The communist destroyed all but one roman church in Russia. I think the nuns know history and know exactly what isis is doing. They’re upset about the Mary statue because she is the glue that holds this culture together.